Appearing at the House of Commons despatch box for the regular weekly session of Prime Minister’s Questions (PMQs), Prime Minister Theresa May made a statement to MPs confirming the start of the two-year extraction process. 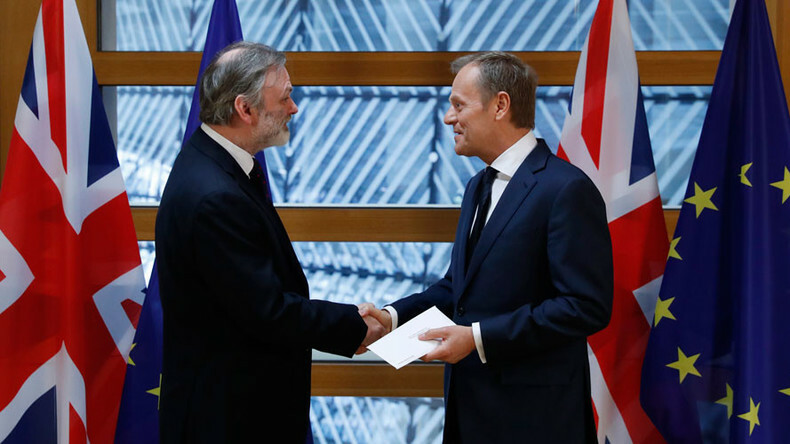 At the same time, British ambassador to Brussels Tim Barrow delivered a letter signed by the PM to the European Council President Donald Tusk in Brussels. Once it was accepted, Article 50 was officially triggered. Speaking to MPs, May said: “The article 50 process is now underway … the UK is leaving the EU. May says the UK will not try to “cherry pick” in Brexit talks, and wants “smooth” and “orderly” negotiations. She confirms the rights of the 3 million EU nationals in Britain will be an early priority in negotiations. May has conceded there will be “consequences” to leaving, but it is in the interests of both the UK and the EU that there is as little disruption as possible. "Now's the time to be united" @theresa_may says on #BrexitDay after triggering Article 50 and kicking off the #Brexit process. Labour leader Jeremy Corbyn has condemned the “reckless and damaging” direction of Brexit, responding to May’s statement in the House of Commons. He has vowed that Labour will not give the government a “free hand” - to jeers from MPs, because he demanded they vote for Article 50. Tusk spoke to the media following the triggering of Article 50. “There is no reason to pretend that this is a happy day - neither in Brussels nor in London. Afterall, most Europeans including almost half the British voters wish that we would stay together, not drift apart. For me, I will not pretend that I am happy today,” he said. Tusk: Will share draft EU27 #Brexit guidelines with Member States on Friday for adoption by #EUCO on 29 April. He has stressed that “for now, nothing has changed. Until the UK leaves the EU, EU law will continue to apply to and within the UK.” This was possibly in reply to earlier attempts by London - now abandoned - to stop EU citizens from moving to the UK in the two years before Brexit. Tusk says negotiations will begin for an “orderly withdrawal.” He says on Friday he will share a proposal of guidelines to the 27 member states to be adopted by the EU council on April 29. After Article 50 is triggered, there are two years to complete negotiations.